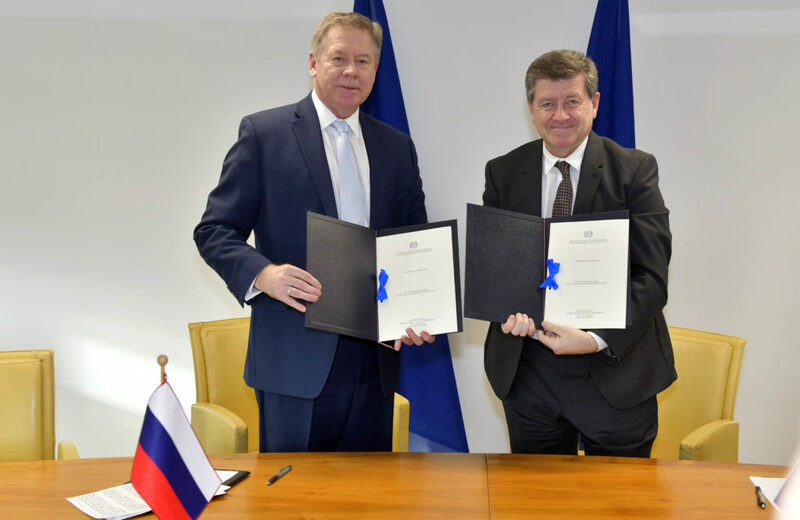 The Russian Federation becomes the 28th country to ratify the ILO Forced Labour Protocol, demonstrating its commitment to combat forced labour and making a significant contribution to the ILO’s centenary. The Russian Federation ratified the ILO Forced Labour Protocol today, in presence of the Director General of the ILO, thereby becoming the twenty-eighth country worldwide to ratify the Protocol. “This ratification reflects the importance Russia attaches to the implementation of one of the key ILO documents aimed at the eradication of forced labour worldwide”, said H.E.Ambassador Gennady Gatilov, Permanent Representative of the Russian Federation to the UN in Geneva. “It is of special meaning in the year the ILO celebrates its 100th Anniversary, as the Protocol is part of the Centenary focus launched by the International Labour Office. The Russian Federation is a Party to all 8 fundamental Conventions of the ILO. It has recently ratified a number of other important ILO Conventions demonstrating its commitment to international labour standards”. “This ratification is all the more important since the ILO’s global estimates show the urgency of adopting immediate and effective measures to eradicate forced labour and trafficking”, said ILO’s Director-General Guy Ryder. The ILO estimates that 24.9 million people are victims of forced labour around the world generating some US$150 billion a year in illicit profits. Several economic sectors are affected, including agriculture, domestic work, construction, industry and mining. “This is also a crucial step towards the achievement of decent work and the delivering of the UN Sustainable Development Goals at the country-level. This ratification also reflects a significant contribution from the Russian Federation to mark the ILO’s Centenary”, added Mr Ryder. The Russian Penal Code defines as a crime the elements of trafficking in persons or trade in people and the use of slave labour. Moreover, Federal Act No 119-FZ of 20 August 2004 of the State of Protection of Victims, Witnesses and Other Participants of Criminal Proceedings has been adopted along with a State Programme for ensuring the safety of victims, witnesses and other participants of criminal proceedings. The Government has also strengthened its cooperation with the Commonwealth of Independent States (CIS), by implementing the Programme of Cooperation for the period 2014–18 aimed to take action against trafficking in persons among the CIS member States.